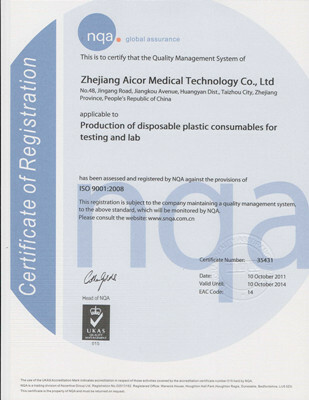 Company Overview - Zhejiang Aicor Medical Technology Co., Ltd.
9YRSZhejiang Aicor Medical Technology Co., Ltd.
Zhejiang Aicor Medical Technology Co., Ltd. is located in Huangyan, Zhejiang, where is the renowned Hometown of Oranges & Land of Moulds in China. Based on modern management theories, Aicor is specialized in developing, manufacturing and marketing of disposable medical consumables in the field of clinical inspection and biochemical laboratory.With perfect organization and advanced management, Aicor has a professional work team which has been engaged in the mould making and production control of medical & laboratory consumables for over ten years, meanwhile, we convene a group of well trained and experienced workers for the production line. In our company, we possess high-tech production equipment, including high-precision Computer Numerical Control (CNC) machine tools, automatic robot arm and so on. 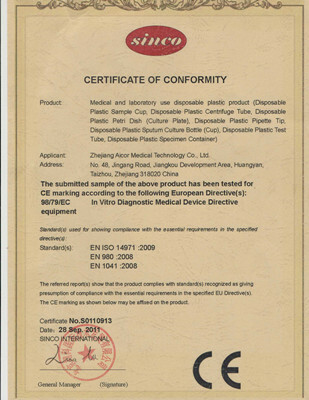 In order to meet diversified demands from customers, Class 10,000 clean room, product quality inspection center, mould design & making center, EU standard EO sterilization workshop are built in Aicor. Complete production facilities and practiced management team provide guarantee for the implement of internationalized production standard in Aicor effectively. From the raw material incoming to finished products leaving factory, the operation mode of chain effect is performed strictly in our company. Combined with the excellent sales team, we offer high quality products and perfect service to customers wholeheartedly.Pursuing the tenet of "Best Quality at Reasonable Price", Aicor will keep moving and make continual innovation, trying to reach perfection. In the future, we'll expand the business in the global market, seek more customers for cooperation, develop new products and promote sales in the market. Aicor will develop outstanding products and innovated service to customers constantly, sharing the value, success and joyance with all partners.